Please check an important announcement under the "Submission Guidelines" session. 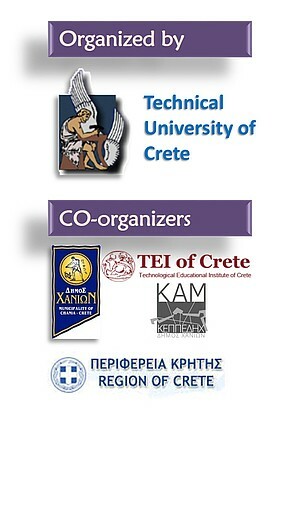 In order to properly organize the social events, filling a pre-registration form is necessary.Please fill the form and send it to the conference email (safechania@gmail.com) by 18th May 2015. The international workshop: «SafeChania 2015: The Knowledge Triangle in the Civil Protection Service" will be held on 10-12 June 2015 at the Venetian Harbor of Chania in the island of Crete in Greece. Natural Disasters: forest fires, earthquakes, floods, landslides, rockfall events, volcanic activity, tsunamis, etc. Industrial Accidents: water and air pollution, energy, mining industry, large infrastructure (i.e. dams) collapse, etc. Transportation Accidents: major maritime / aviation / train accidents, transport of hazardous materials, etc. Other incidents: search and rescue, humanitarian aid, emergency response centers, etc. Key-note lectures from decision makers and stakeholders will be provided. During the workshop parallel events for networking and joint project preparation will take place. Participants wishing to present their work have to submit an abstract by 20-March-2015 and a paper by 4-May-2015. Oral and poster sessions will be included into the SafeChania2015 program. All accepted papers will be freely available through the workshop's on-line Book of Proceedings. Selected papers will be peer-reviewed and included into an International Journal Special Issue.